Jonker Street in Doncaster is named after a popular street in Malacca, Malaysia which has now taken over the location that Ronz Roti Kaya used to occupy. The menu at Jonker Street is actually quite extensive, they offer an array of noodle and rice dishes, as well as congee which include your Malaysian staples like Nasi Goreng, and Curry Laksa but they also serve mains if you prefer to share dishes and take the opportunity to try a few more dishes at a time. Not many places can do a good Assam Laksa, it’s usually either it lacks in flavour or their use sardines which often changes the entire flavour of the broth. I found the Assam Laksa here to be lacking in flavour, it tastes slightly watered down which is disappointing. I’d say it’s around 70% of the intensity it should be at. 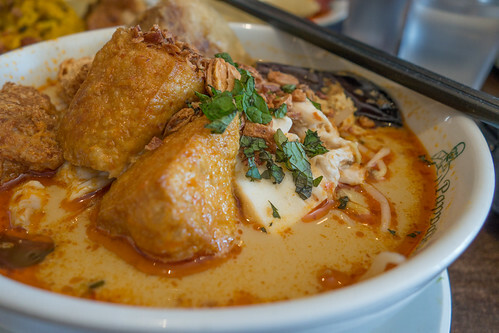 The Curry Laksa here is surprisingly good, but it isn’t your typical Laksa that you might find in Laksa King or Chef Lagenda that are more creamier. 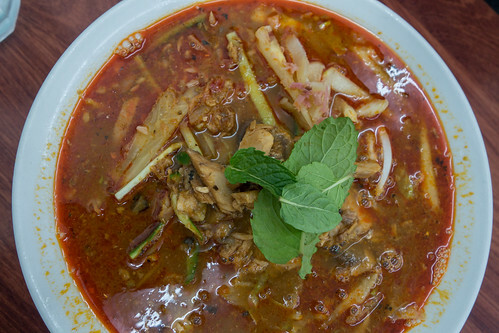 The Laksa tastes like your typical Chicken Curry sauce but as a broth, which has this lovely spiciness to it that it needs. The Pan Mee here also has the same issues that the Assam Laksa has, which is that the soup base lacks flavour but more so in this case. The Pan Mee broth should have the flavour of pork and dried anchovies, but it really doesn’t have any taste to it at all so I had to add a lot of chilli to give it flavour. 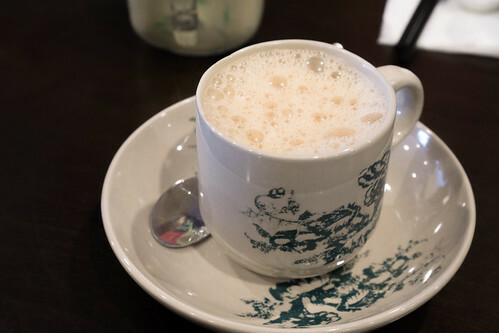 The Teh Tarik isn’t too bad, maybe just a tad too sweet and not pulled enough but overall it’s decent! 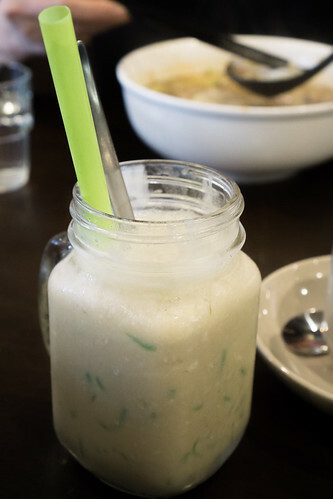 The Ice Cendol has the balance of gula melaka syrup and coconut milk all out, it needs a lot more gula melaka. There isn’t anything that stands out to me at Jonker Street, though the Chicken Laksa is probably one of the better dishes but it seems like they have issues with making their broths more intense in flavour. Maybe their other dishes are better, but at the moment I’m in no hurry to try it again. I first came across Frozen by a Thousand Blessings in Richmond, after a bowl of ramen next door. I was so happy when I saw that they had opened another outlet in the Doncaster Shopping Centre. What I love about their frozen yoghurts is how creamy they are but taste quite light and fresh. Most of the time I don’t even need the toppings as not to spoil the flavour of the yoghurts. Frozen have a great variety of flavours and the one that I always go back to is their Coconut flavour, with desiccated coconut shavings to give it that added texture. The popping pearls with mango inside as a topping are something I recommend adding to the coconut one! The other flavours that I love were the Pomegranate and Almond Milk & Hazelnut. Super delicious. 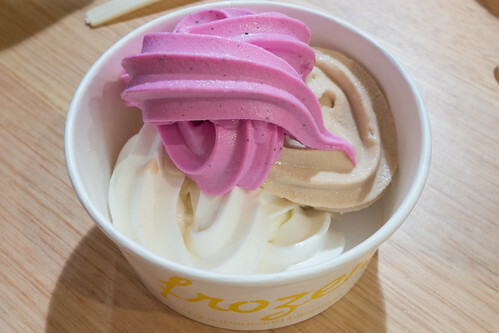 One of the best frozen yoghurt places in Melbourne. 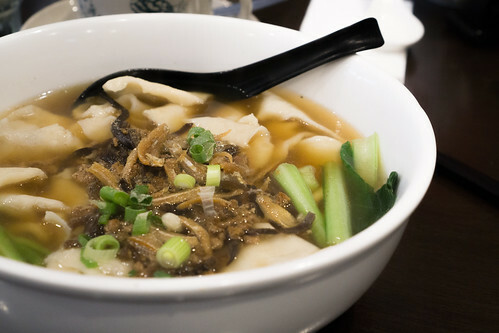 Ramen Bankara has now three outlets with the two cities stores opening up in the last couple of months. However, it was the Doncaster outlet that was first in Australia, located inside the Westfield shopping centre and providing more options for those wanting Japanese cuisine with Hanaichi and Hakata Gensuke preceding it. I love ramen and even when I was in Japan, I never tired of it. 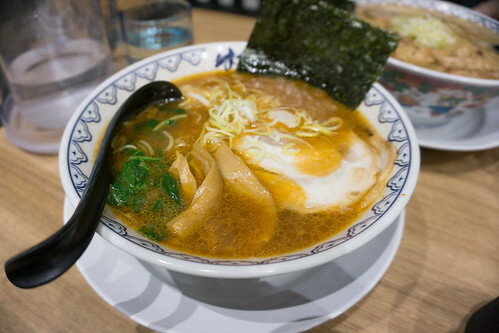 Ramen Bankara has a choice of three different soup bases with your choice of add ons such as eggs, chashu, bamboo shoots and seaweed. Each classic option has a premium version with more add ons. Their Bankara Ramen has pork broth as its base and it’s absolutely delicious. It has an amazing rich pork flavour, and their pork belly is so tender. One downside, was the amount of fat floating in the broth. I’d love if they sieved a bit of it out but other than that, it’s the one to get. 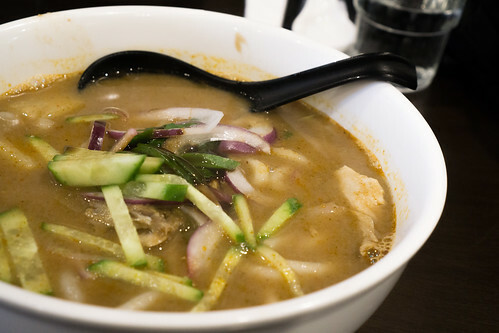 Chuka Soba Ramen is another pork broth but this has the added option of getting it spicy. It’s a milder broth and a bit more tangy and cleaner for the palate. 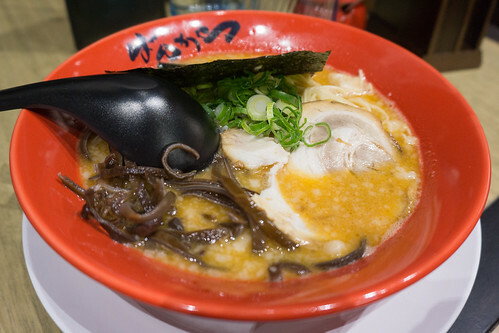 Ramen Bankara’s Tonkotsu can also be ordered spicy, and it’s more creamy than the Chuka Soba. It’s made from pork bones that give it that creamy texture. I like the spicy kick more in the Tonkotsu. 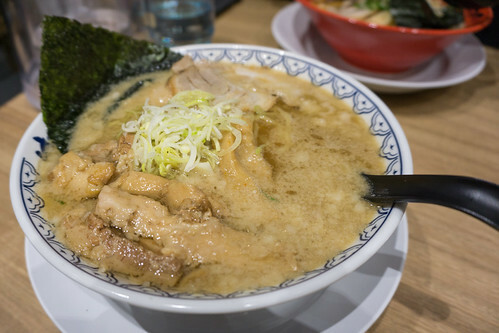 There aren’t too many choices for good ramen around these parts of town so Ramen Bankara satisfies those cravings just nicely. PappaRich is practically everywhere in Melbourne, and interestingly their Doncaster outlet is located in a separate building and not part of a shopping centre or shopping strip. It’s a spacious area but bustling during the weekends. 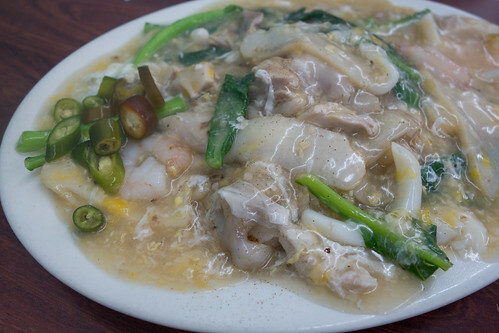 If you had never been to a PappaRich before, they basically offer a wide selection of Malaysian rice, noodle and roti dishes along with a an almost innumerable amount of drinks to choose from. 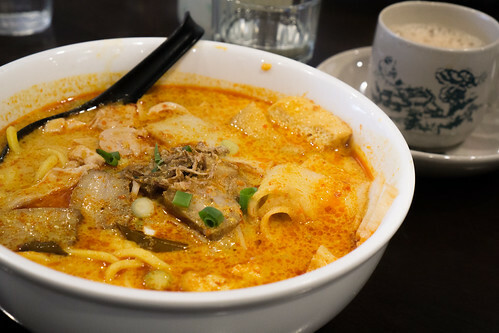 PappaRich’s Chicken Curry Laksa is one of the better laksa’s around town, but still the ones to beat are Chef Lagenda and Laksa King. It’s just creamy enough, with the right amount of chilli and spices. With a hint of mint to freshen it up. 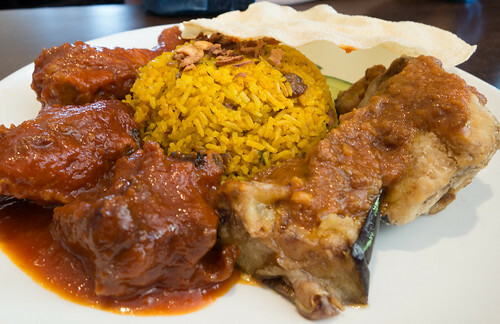 Their Red Chicken Briyani with Fried Eggplant is a dish you wouldn’t often come across as it leans towards the more Indian/Malaysian style of cooking unlike most Malaysian restaurants which are more Chinese influenced. I love Briyani and the rice here has that lovely spices infused into the rice, but I detest sultanas in dishes so I very rarely (read: never) order this. Comes with a crispy thin pappadam too! 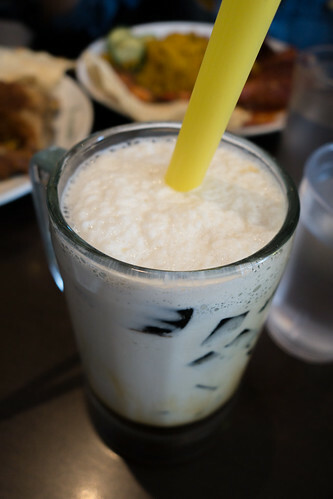 Their drinks are usually quite good, I opt for the Soy Bean Milk with Grass Jelly on many occasions because it’s not too sweet and getting it with jelly is always enjoyable. Doncaster outlet doesn’t stray too far from the standard set by Chadstone or Glen Waverley so it’s nice to have one on the eastern side of town. Penang Flavours on Doncaster Road, minutes drive from Doncaster Shopping Town used to be under the same name as the Malaysian eatery in Wantirna, Straits Cafe. Although under a new name, the food remains just as good as before. 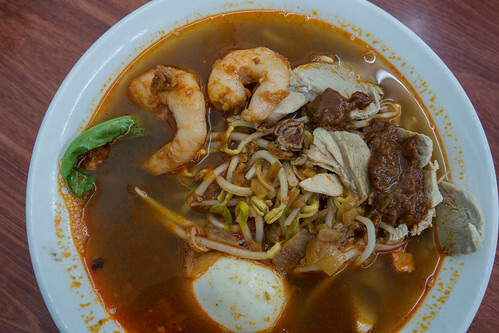 Their Har Mee has a lovely prawn soup base flavour, and the sambal mixed in gives it a nice chilli aroma. My only downside I found is the oiliness in the dish, as is apparent in the picture above but I guess that comes with eating out. Penang Flavour’s Assam Laksa wasn’t anything special. Assam Laksa really needs that sweet, sour combination to soup base but also with that subtle fish flavour. Not to say it was bad, it isn’t. Not many Malaysian restaurants can actually do it well actually. Malaysian Kitchen also is located close by to Penang Flavours, but if I were to choose, I’d definitely go with Penang Flavours. Their Char Kway Teow is one of the better ones in Melbourne too.